The United States and its allied warplanes have sunk over 100 ISIS boats, 65 of them being sunk in the month of September alone. An international military coalition has reported that the terrorist organization has been using the Tigris and Euphrates rivers to transport fighters, explosives, supplies, and even carry out attacks. ISIS uses a variety of barges, skiffs and motorized watercraft to create their makeshift navy. ISIS militants will typically fill the ships with explosives and then detonate them when they reach popular bridges or thoroughfares. The tactic is meant to prevent opposing militaries from traveling to ISIS strongholds while simultaneously crippling local economies. The United States has made it their mission to destroy these ships before they can do any damage. The U.S. and its allies have been carrying the strikes out for months but recently saw a massive uptick in the past few weeks. Over 50 ISIS boats were destroyed on September 14 and 16 alone. Military officials fear that, despite destroying a mind-boggling number of ISIS boats in such a short period of time, the efforts are in vain. 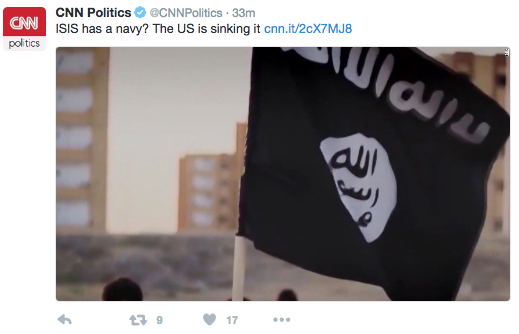 Losing the ships has little to no monetary impact on ISIS as they typically steal the ships from local fishermen.